Planting trees and vegetation in cities is a great way of reducing the urban heat island effect, improving air quality and can benefit mental health and overall happiness. With land at a premium, the space for more greenery and natural space becomes harder to find in our cities. 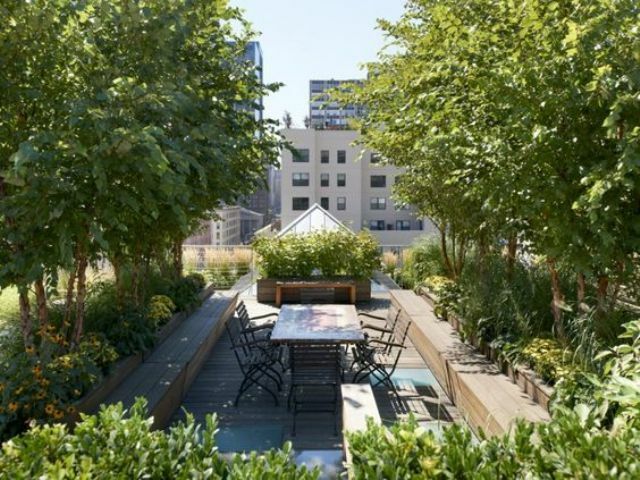 This is why rooftop gardens have become so popular over recent years. Incorporating trees into a roof garden design not only exponentially increases the above benefits, but also creates instant visual amenity to the skyline. Working with some of the worlds most innovative producers of confined root cell and guying technology, Down to Earth work with specialist roof garden designers to sustainably incorporate trees in to any development, and assist with the production of post planting aftercare regimes to increase success rates. These trees will eventually require management however! As professional arborists specialising in niche applications of arboriculture, we provide tree management plans from consultation through to execution for many of the rooftop gardens within the United Kingdom and Europe. Applying the basic principles of tree management but with the added logistical issues surrounding access and disposal of arisings, is something that Down to Earth have perfected. Down to Earth advised and assisted the main contractor team at the refurbishment of Economist Plaza in Mayfair, London, on the new potted trees installed in the site plaza. Their input and implementation led to the successful handover of this element of works.